Elder Scrolls Shivering Isles is one of the most captivating games in the series and had me enthralled for days on end as I attempted to complete it which was much more difficult than I had ever thought it would be. The game has great graphics but the actual game play is a touch disappointing but the rest of the aspects make up for this just fine. Good game all round. 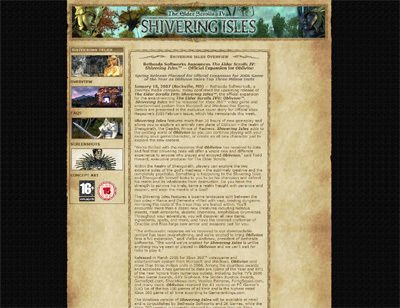 We have also compiled a Review System for this, of which Elder Scrolls Shivering Isles is Rated as Three Stars, the third highest possible score available from the Game Review Team.